The AIIMS Jodhpur Recruitment is passed by the officials of All India Institute Of Medical Sciences, Jodhpur through their official’s page for 139 posts. So, candidates can refer here for the AIIMS Jodhpur Faculty Vacancy and the AIIMS Jodhpur, Associate Online Form starting and ending dates are 16th March 2019 and 15th April 2019. For more details, candidates can check the official notification. AIIMS Jodhpur Faculty Recruitment 2019 is released. AIIMS Jodhpur Recruitment was out through the official advertisement. So all the job seekers who are looking for this wonderful opportunity they can get the check the recruitment details at here only. They are inviting the application form to fill the 139 Faculty Posts. The AIIMS Jodhpur, Rajasthan is recruiting every year. So many candidates had got employment in the organization. So at present, this is for you. To proceed further just refer the educational details, age limit etc at the below of this page. So that will be very helpful to the aspirants. The Official links are attached at the bottom of this page. Who did not reach the qualification as per the requirement of AIIMS Jodhpur Recruitment, those applications were rejected? You can also search for the Govt jobs in Rajasthan. For the AIIMS Jodhpur, Associate Online Form Links candidates can check here. AIIMS Jodhpur Faculty Jobs: The Links were deactivated after the last date of 15th April 2019. We are giving the Source file to the candidates. The Applicants will attend the selection rounds as per the given dates. This is a great opportunity for applicants. So grab this chance by applying the AIIMS Jodhpur Associate Professor Recruitment. The attending candidates will get the Admit card which will be issued by the officials. Visit the mandatory details to apply for the recruitment. They organize the selection rounds of written test, interview etc. To clear the Selection rounds the weapon of previous papers are needed to everyone. We have offered the application links to apply online. All the candidates can fill the AIIMS Jodhpur Associate Online Form. To apply for the AIIMS Jodhpur Faculty Recruitment 2019, Contenders must and Should qualify in either one of the Graduations. Those are MD, MS, Post Graduate, D.M, M.Ch, Doctorate degree from the Recognise Board or University. Age limit should be Maximum 58 Years for Professor and Additional Professor and 50 years for Associate Professor and Assistant Professor. The AIIMS Jodhpur Assistant Professor Recruitment Application Fee is varied according to the Reservation category. Application Fee can Pay through the Online Mode i.e Payment gateway of AIIMS, Jodhpur. The Selection of the Candidates based on the following phases. The All India Institute of Medical Sciences pays Rs.1,01,500 – Rs.1,68,900/- for the selected candidates. First, complete the AIIMS Jodhpur Faculty Application before 15th April 2019. After that prepare for the selection process. To filter in the capable persons they are conducting the Written test and interview. At recruitmentindia.in you can get new job notifications. So candidates kindly follow this web portal to get more information. They will announce the results after the examination. We would like to give the Application fee details as per the category only they Should pay the application fee. Just think once before proceeding this AIIMS Jodhpur Recruitment notification. 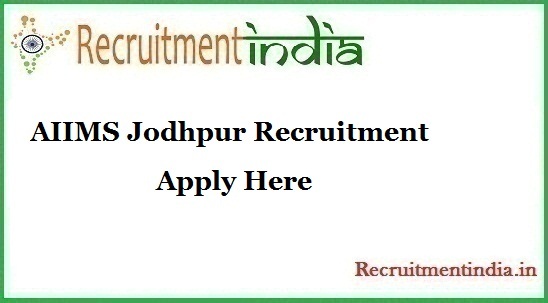 The offered candidates job location will be Jodhpur. Contenders don t late and then check the details of the notification d then apply for this AIIMS Jodhpur Assistant Professor Recruitment. Click on the link Check AIIMS Jodhpur Recruitment 2019. AIIMS Jodhpur Recruitment 2018 was out for Junior Resident Vacancies in Rajasthan. They want to fill the 40 Junior Resident Jobs. So eligible candidates can get apply this AIIMS Jodhpur Junior Resident notification which is available in www.aiimsjodhpur.edu.in recruitment page The application form enable from 31st July to 10th Aug 2018. All India Institute Of Medical Sciences, Jodhpur has been released the Aiims Jodhpur Recruitment to recruit around 40 Junior Resident Posts vacant seats. For this AIIMS Recruitment Process, the Applicants need to download the Aiims jodhpur Junior Resident Application format to send your Required details to the AIIMS Jodhpur Recruitment Board. The AIIMS Junior Resident Recruitment Application form valid till on 10th Aug 2018. The Date of AIIMS Jodhpur Junior Resident Recruitment is advertised from 31st July 2018. The necessary Details such as educational qualification, Age limit & the Payscale & also the Walk in the venue which are finest points for applying this AIIMS Jodhpur Junior Resident Recruitment. Aspirants have to possess MBBS Degree or equivalent from recognised board. Junior Resident does not exceed 30 years. The category wise application fee details are mentioned at the below of this page. General/ OBC category: Rs. 1000 + transaction charges as applicable. Online only you can apply to this notification. These are the selection rounds That the applicants need to face.